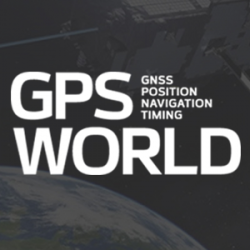 A roundup of recent products in the GNSS and inertial positioning industry from the April 2018 issue of GPS World magazine. 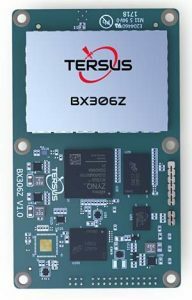 The BX306Z GNSS real-time kinematic (RTK) board has powerful flexibility and compatibility to meet the needs of original equipment manufacturers (OEMs) and system integrators. The BX306Z is a cost-efficient board for positioning and raw measurement output. The board is a compact, multi-GNSS (GPS L1/L2, GLONASS G1/G2, BeiDou B1/B2) RTK module with centimeter-level accurate positioning capability. It is able to integrate with autopilots and inertial navigation units. Log and command is compatible with major GNSS boards. Terrablast polymer-based patch antennas are 30 percent lighter than their ceramic counterparts and extremely resistant to fracture upon impact. They are designed for the automotive and unmanned aerial vehicle (UAV) markets, where impacts are possible but antenna performance cannot be compromised. 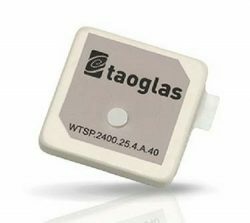 The 35-mm GPS/GLONASS/BeiDou patch antenna has high efficiency of more than 70 percent across all bands, improving time to first fix. All Terrablast antennas undergo rigorous temperature, vibration and impact tests, exceed ISO 16750 standards, and are manufactured in Taoglas’ purpose-built facilities in Taiwan and the United States. The S1216F8-GI2 is a NavIC + GPS/GAGAN receiver module for emerging intelligent transport systems (ITS) applications requiring NavIC/GPS capability in India. It integrates an L1/L5 RF front-end and baseband processor capable of receiving up to 14 L5 NavIC signals and up to 20 L1 GPS/GAGAN signals simultaneously. With six NavIC signals and three GAGAN signals, it offers 18–23 usable signals, providing improved accuracy in urban canyons. The S1216F8-GI2 is form-factor and pin-out compatible with 12 x 16-millimeter modules, enabling drop-in replacement. NavIC sub-frame data outputs broadcast warning messages for weather alerts and natural disasters. The S1216F8-GI2 is manufactured with ISO/TS 16949 automotive certification. 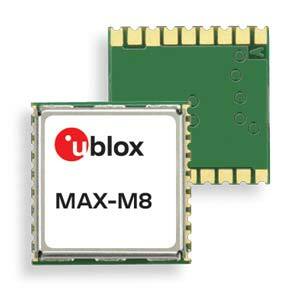 The automotive-grade MAX‑M8Q‑01A GNSS module measures 9.7 x 10.1 x 2.5 millimeters and has an operating temperature range from –40° C to 105° C. It is designed to meet the stringent requirements of the automotive market, providing superior positioning accuracy even in challenging environments such as urban canyons. 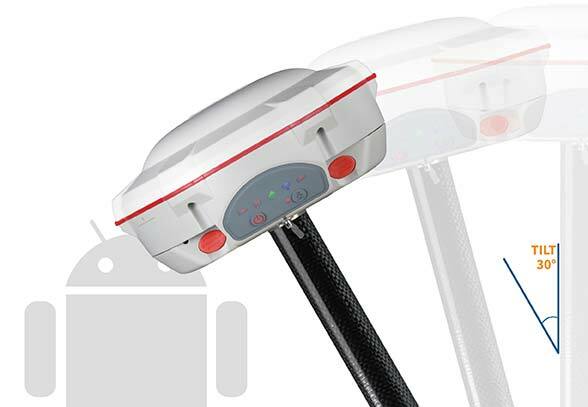 Its temperature range ensures reliable performance in harsh environments, such as when mounted in a car‑roof antenna. The Teseo APP receiver enables safer autonomous driving. 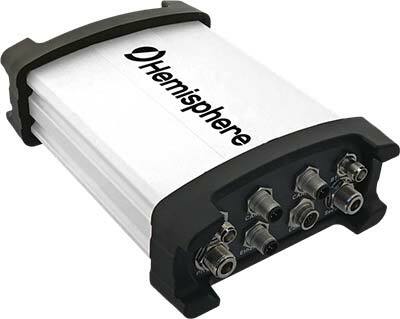 The multi-frequency GNSS receiver chipset is suitable for safety-critical automotive applications and high-accuracy positioning at the decimeter and centimeter levels for precise point positioning (PPP) and RTK applications. 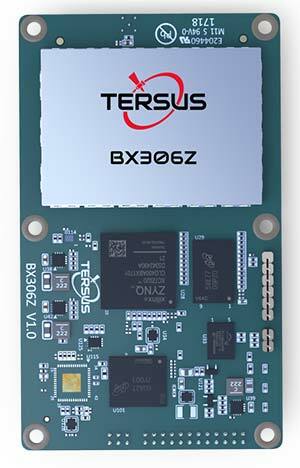 By tracking satellites of all GNSS constellations simultaneously on at least two of the frequencies used by each system, ST’s automotive-quality Teseo APP (automotive precise positioning) receiver provides high-quality raw GNSS data for PPP and RTK algorithms, which allows accurate positioning and rapid convergence time worldwide. The receiver monitors the integrity of the satellite data to alert the system if accuracy is degraded for any reason. This permits Tier-1 manufacturers to certify safety-critical systems in accordance with ISO 26262. Qinertia post-processing kinematic software has been designed to help surveyors get the most of their surveys. After the mission, Qinertia gives access to offline real-time kinematic (RTK) up-to-date corrections from more than 7,000 base stations in 164 countries. By creating a virtual base station near a project, the software delivers the highest level of accuracy without having to set up a base station. An advanced tight coupling algorithm delivers high accuracy and maximizes RTK availability. Trajectory and orientation are greatly improved by processing inertial data and raw GNSS observables in forward and backward directions, especially in challenging environments. With Qinertia, surveyors can quickly identify and solve issues such as mechanical installations or sensor alignment. The T300 Plus GNSS receiver is designed for demanding surveying tasks, with full-constellation tracking capability, tilt compensation, 4G/Wi-Fi connection, 8-GB internal memory and an easy survey workflow with Android-based Survey Master Software. It is designed to make collecting accurate data easy and fast, whether done by a beginner or experienced professional surveyor. As an upgrade of the T300, SinoGNSS T300 Plus combines a GNSS board, Bluetooth and adjustable TX&RX UHF, Wi-Fi and 4G modem into one rugged device. Its built-in 4G modem ensures the T300 Plus works with all kinds of continuously operating reference stations (CORS) worldwide. A built-in tilt sensor supports maximum 30° pole tilt and keeps the compensation accuracy within 3 centimeters; the user can check the electronic bubble on the controller for fast surveys in the field. 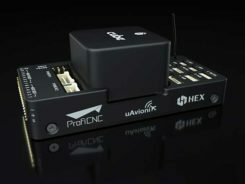 The Vector V1000 GNSS receiver is designed for precision marine applications, such as hydrographic and bathymetric surveys, dredging, oil platform positioning, buoys and other applications that demand the highest level 3D positioning accuracies. It provides high-accuracy heading, position, pitch, roll and heave data. The V1000 supports multi-frequency GPS, GLONASS, BeiDou, Galileo, QZSS and IRNSS (with future firmware upgrade and activation) for simultaneous satellite tracking. 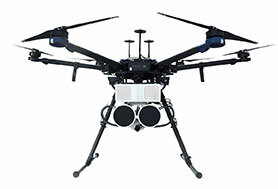 The receiver is powered by Hemisphere’s Athena real-time kinematic (RTK) engine and is Atlas L-band capable. Based on Hemisphere’s Eclipse Vector technology, the V1000 uses the most accurate differential corrections including RTK and Atlas L-band. It has an integrated display that can be conveniently installed near the operator. The V1000 has heading accuracy of better than 0.01 degree when using a 10-meter antenna separation. 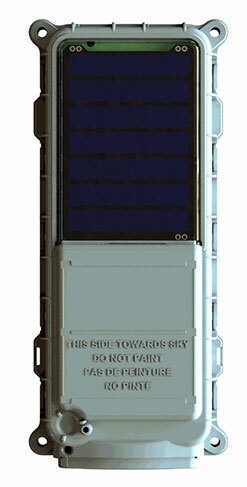 The SmartOne Solar M2M/IoT device is solar-powered and offers Bluetooth Low Energy connectivity while addressing the growing global demand for reliable and affordable remote monitoring and automated data collection of assets located both within and beyond terrestrial networks. The SmartOne expands the market for remote connectivity to include assets that are otherwise difficult or expensive to reach for power replacement, and lowers the operating cost of monitoring assets being served by legacy SmartOne products. SmartOne Solar’s rechargeable batteries can deliver more than eight years of serviceable life. Without exposure to the sun, a fully charged unit can operate for many months while reporting twice daily. The product’s Bluetooth connectivity allows wireless device configuration and firmware upgrades in the field. 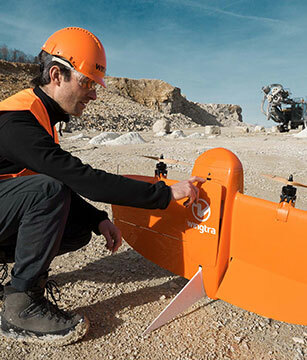 The WingtraOne post-processed kinematic (PPK) drone is the result of collaboration with Pix4D and Septentrio. It is able to deliver orthomosaic maps and 3D models with an absolute accuracy down to 1 centimeter (cm), offering broad coverage and high resolution with ultra-precise accuracy. The WingtraOne can cover 130 hectares (320 acres), equivalent to 240 football fields, in a one-hour flight, and deliver maps at ground sample distances below 1 cm/pixel. Vertical take-off and landing (VTOL) offers hands-free operation and a smoother ride for onboard sensors as well as greater coverage than comparable multi-rotor UAVs. PPK computes ultra-precise geolocations for each image by combining the GNSS data with correction data from a nearby reference receiver. It offers a root-mean-square (RMS) error of 1.3-cm horizontally and 2.3-cm vertically without any ground control points. DroneHunter is a fully autonomous UAS airspace defense solution. The intelligent robotic aircraft is enabled with TrueView radar designed and engineered for physical remediation of intruder or threatening drones. DroneHunter is an autonomous UAS perimeter detection and protection solution designed to quickly detect, classify and secure against drones and other UAS. 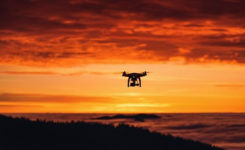 When an intruder drone is discovered, DroneHunter can engage autonomously via artificial intelligence (AI)-directed detection, tracking and guidance. Once the rogue drone is identified and the threat level analyzed, DroneHunter safely remediates the threat day or night, at a safe stand-off distance, with no collateral damage. DroneHunter supports multiple drone platforms based on use-case requirements.